Electronics Expo offers the Sharp 1080p 3D Blu-ray Disc Player, model: BD-AMS20U, for the in-cart price of $96.98. Coupon code "EXPLODE" drops it to $75 with $9.99 for shipping. Electronics expo offers Denon DHT-1513BA Total 650 Watt 5.1 Channel Home Theater System with Boston Acoustics Premium Speaker System for $498.99. Electronics Expo offers the Sharp AQUOS 32" 720p Widescreen LCD HD Television, model: LC-32D59U, for $328. Coupon code "GRANDSLAM" drops it to $244.80 with $31.99 for shipping. Features/Specifications: native resolution:1366x768 (720p), 8.5ms response time, USB, four HDMI inputs, and VGA and other video inputs. Electronics Expo offers the Yamaha YAS-101 2.1-Channel Compact Surround Sound Bar System for $224.95. Coupon code "BACKTOSCHOOL12" drops it to $169.26 with $14.99 for shipping. Electronics Expo offers the Denon 7.1-Channel 3D-Ready Integrated Network Home Theater Receiver, model: AVR-2112CI, for $441.88. Coupon code "GRANDSLAM" drops it to $408.22 with $26.99 for shipping. Electronics Expo offers the Canon EOS Rebel T4i 18-Megapixel Digital SLR Camera Body together with the Canon EF-S 18-55mm f/3.5-5.6 IS II Lens, model: 6558B003, for $913.98 with $9.99 for shipping via coupon code "GRANDSLAM"
The new T4i features a 3" vari-angle touchscreen LCD, 5 fps continuous shooting speed, and improved autofocus when compared to the T3i. 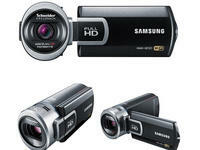 It also features 1080p video recording, mini HDMI output, SDHC/MMC card slot, USB, and more. Electronics expo offers Samsung HMX-QF20 black HD 20X ZOOM FLASH CAMCORDER for $207.76 after $10.00 off coupon code "LSEPT10". 5MP BSI CMOS super low light sensor. HD Capture and Recording. Crisp Still Photos. Wide Lens with 20x Optical Zoom and OIS Duo. 2.7" Touch Screen LCD with Switch Grip. Electronics Expo offers the Denon 1,260-watt 9.2-Channel Home Theater Receiver, model: AVR-4311CI, for $2,099. Coupon code "GRANDSLAM" drops it to $1,193.66 with $29.99 for shipping. Features/Specifications: 140 watts per channel into nine channels, DTS-HD Master Audio, DTS-HD High Resolution, Dolby TrueHD, and Dolby Pro Logic IIz decoding, 1080p HDMI 3D pass-through with two outputs, two subwoofer outputs, seven HDMI inputs, and more. Electronics Expo offers the Pentax K-5 16.3-Megapixel Digital SLR Camera Body with the Pentax DA AL WR 18-55mm f/3.5-5.6 Lens, model: 14762, for $1,008.99. Coupon code "EXPLODE" drops it to $964.92 with $9.99 for shipping. Electronics Expo has Definitive Technology BP6 Tower Loudspeaker in Black (Single Speaker) for $399 - $234.08 off via code GRANDSLAM = $164.92. 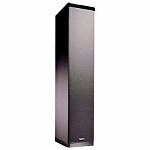 Electronics Expo has Definitive Technology BP6 Tower Loudspeaker in Black (Single Speaker) for $399 - $228.99 discount code GRANDSLAM = $170.01 + $19.99 shipping. Electronics Expo still offers the Denon Over-Ear Headphones in Black, model: AH-D1100, for $199. Coupon code "EXPODEALS" drops them to $89.92 with 9.99 for shipping. Electronics Expo offers the Denon Advanced Noise-Canceling Over-Ear Headphones , model: AHNC800, for $349. Coupon code "EXPLODE" drops them to $173.01 with $9.99 for shipping. Electronics Expo also offers the Denon Reference Over-Ear Headphones, model: AH-D5000, for $698.99 before the above coupon, $369.92 after with $9.99 for shipping. Electronics Expo offers the Denon 7.1-Channel 3D-Ready Integrated Network Home Theater Receiver, model: AVR-2112CI, for the in-cart price of $506.05. Coupon code "GRANDSLAM" drops it to $408.47 with $29.99 for shipping. Features/Specifications: 90 watts per channel into seven channels, six HDMI inputs and one 3D-ready HDMI output, and Dolby TrueHD, Dolby Pro Logic IIz, DTS-HD Master Audio, and other surround sound modes. Electronics Expo discounts select Harman Kardon home theater receivers via coupon code "GRANDSLAM" with shipping starting at $19.99. 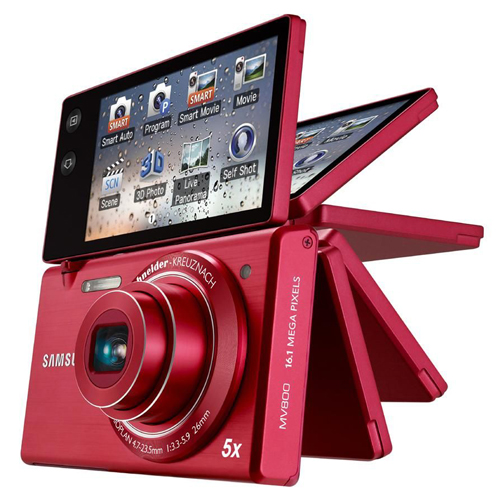 Electronics-Expo offers Samsung MV800 Digital Camera for $149.95 + $6.95 shipping. Electronics expo offers Altec Lansing Octiv Mini Speaker System for iPhone and iPod (Black) for $14.95. Electronics Expo offers the Harman Kardon Soundsticks II 2.1-Channel Speaker System for $108.88. Coupon code "LNY5" drops it to $103.88 with $9.99 for shipping. Electronics Expo offers the Canon EOS Rebel T2i 18-Megapixel Digital SLR Camera with the Canon EF-S 18-55mm f/3.5-5.6 IS Lens, model: 4462B003, for $593.67. Coupon code "FALL5" makes it to $563.98 with $9.99 for shipping. Features/Specifications: a 3" LCD, 1080p video recording, 3.7 fps continuous shooting, mini HDMI output, SD/SDHC/MMC card slot, and more. Electronics Expo is offering large discounts on a wide selection of cameras, audio equipment, TVs, and other electronics as part of its Cyber Monday Specials. Deals start at $8.57 with $2.99 shipping.